With optional part for viola. Composed by Traditional. Arranged by Nico Dezaire. De Haske Play-Along Book. Educational Tool. Book Only. Composed 2002. 24 pages. De Haske Publications #DHP 1023198-401. Published by De Haske Publications (HL.44000711). ISBN 9789043115872. 9x12 inches. International (more than one language). This collection of easy duets is suitable for violinists who have some experience of playing in first position. The melodies are given mainly to the first part with both parts being of a similar level of difficulty. Eine Sammlung von Duetten fur Violinspieler mit etwas Erfahrung im Spiel in der ersten Lage. Die Melodien englischen und irischen Ursprungs stehen hauptsachlich in der ersten Stimme. Erste und zweite Stimme ahneln sich im Schwierigkeitsgrad. 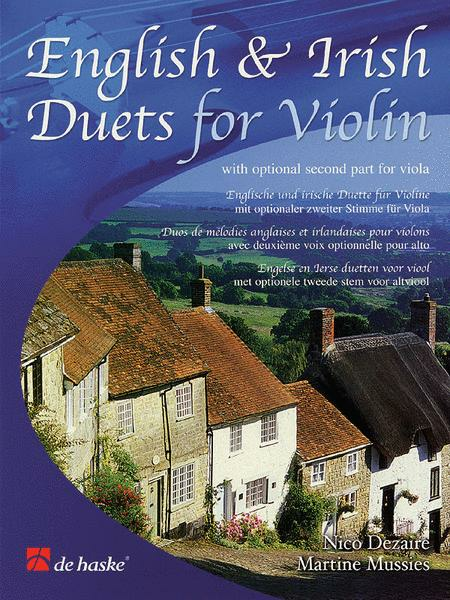 Ausserdem wurde dieser Ausgabe eine Version der zweiten Stimme fur Viola (in der ersten Lage) hinzugefugt. Les melodies anglaises et irlandaises contenues dans ce recueil s'adressent aux violonistes ayant deja une certaine experience du jeu. Le recueil contient une voix optionnelle pour alto. Le melodie inglesi e irlandesi raccolte in questa pubblicazione sono adatte per quei violinisti con qualche anno di esperienza alle spalle. Contenuta nel libro troverete la parte opzionale per viola.
) line is definitely less challenging; however, the collection is arranged well and allowed classically trained musicians to sound like fiddlers for a day. 8 of 20 people found this review helpful.